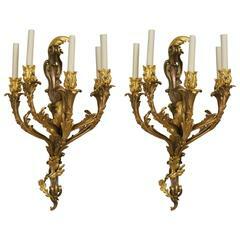 Pair of gilt bronze sconces from the 19th century, Louis XV style, Napoleon III period, 3 lights. Measures: H 63cm, W 36cm, W 20cm. 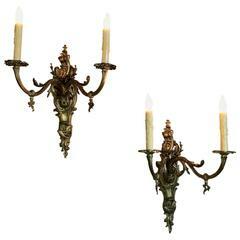 Pair of bronze gilts sconces in the style of Louis XV from the 19th century, signed by the maker G.Van. Candlestick in opaline porcelain. Measures: H 43cm, L 30cm, P 17cm. 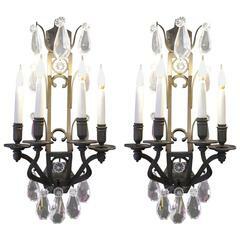 The pair of bronze doré sconces in the style of Louis XV from the 19th century. Candlestick in opaline porcelain, antique style Louis XV. 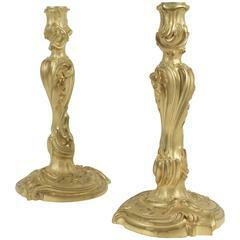 Pair of candlesticks in bronze from the 19th century in the Louis XV style. 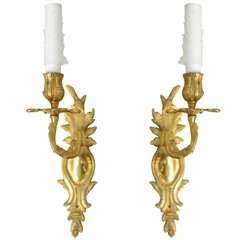 Pair of Louis XV style gilt bronze sconces. 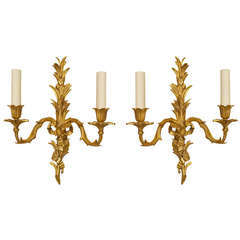 Turn of the century French Louis XV style gilt bronze wall sconce with five arms emanating from a scroll back with floral decoration. 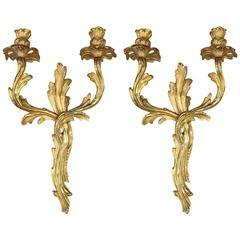 Pair of Louis XV style gilt bronze single light wall appliques with leaf decoration emanating a single branch light.